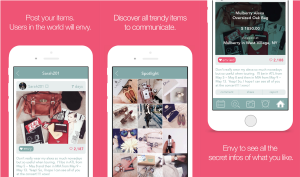 There is a rising service popular among New York celebrities and fashion people to introduce their secret fashion items – Envicase, a showing off SNS for fashion items. Since it started its beta service three months ago, it has been preparing for an official lunching and already established itself as a hot-featured app among New Yorkers. Almost 90% of the users are New Yorkers. It also attracted lots of attentions of the public, introduced at New York Fashion Week in the first half of this year. In the city of fashion, New York, many fashion people and celebrities have shared their news and information through various blog services, community, as well as picture-based SNS like Instagram, Tumbler, Pinterest, and We Heart it. And most of them except commercial bloggers use these services for the purpose of personal branding. However, their item picture introduced with totally pure intention is often discounted as ostentation and at the same time, they’re regarded such as a snob. And this makes people somewhat hesitant about their online activities. Besides, too many miscellaneous postings copied from everywhere and too commercial contents just make people sick, taking visitors’ interests away from their elaborate contents. Like the old saying, ‘Necessity is the mother of invention’, there are lots of positive responses on this new service. Although it is still in its early stage, the response rate per each posting exceeds 3% on average, which is three times over general social media’s. However in the global market, Envicase is still in its infancy and is only a beginning application a few leading fashionistas are enjoying. It is highly expected if it could attract more interests internationally, as it launches its official service soon.